Scottsdale Mortgage Brokers: Why Should You Refinance Your Home? At Scout Mortgage, we strive to be the Scottsdale mortgage brokers who help you to enjoy the lowest costs and rates around. One of our biggest goals is to make shopping for a mortgage incredibly easy to understand. But what about when you already have a mortgage and you want to refinance your home? 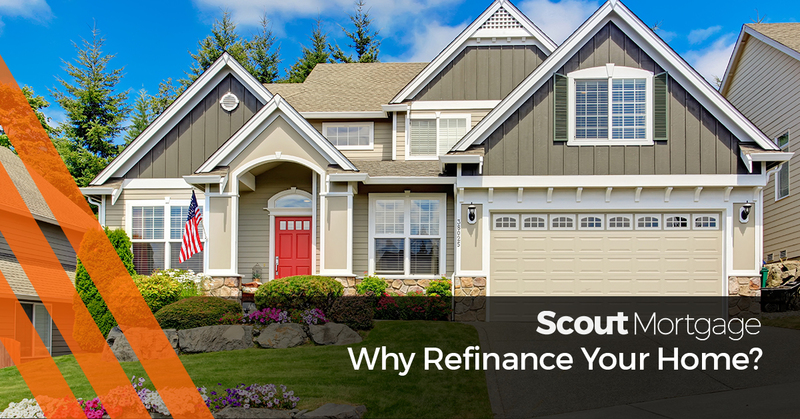 In today’s blog, we’ll take a look at a few reasons to consider refinancing your home loan with Scout Mortgage. We know that different people have different situations and that’s why we’ll work with you on an individual basis to help make certain that you are choosing the option that works best for you. Keep reading to learn more! One of the most appealing reasons to refinance is because you could end up with a much better interest rate than you currently hold. In the long run, this could end up saving you thousands of dollars–who doesn’t want that? Depending on when you financed, how much money you were making when you first got your loan compared to how much you make now, and a number of other factors, you could lower your interest rate pretty significantly. Once again, depending on the original terms of your loan, you could save quite a bit of money by making the switch to a shorter loan term on your mortgage and reducing your interest rates. Because different people have different needs, our mortgage brokers will work with you directly to see what you’d like to get out of a refinanced mortgage and help you to get the most ideal loan term that suits your unique needs. If you’ve owned your home for awhile, you probably have a pretty fair amount of equity built up. Refinancing allows you to pull some of that equity out so you can make some repairs around your home. Been dreaming of a new kitchen? Want to add an addition onto your home? Planning to finish the basement? Perhaps you’d just like to consolidate a bit of your debt into a mortgage loan. This is a great way to do any of the above. At Scout Mortgage, we strive to provide our clients with the best possible options for refinancing. We know that the process can seem intimidating, but we want you to know that with our team on your side, you can rest assured that you are working with the mortgage specialists who want to help you make the choice that is best for your family. Regardless of your needs, you can rely on the experts at Scout Mortgage to be there for you every step of the way. You can learn more about refinancing here or feel free to contact us today to get the process started. Whether you need a loan to purchase your home or you’re refinancing your current home, we’d love to help. We look forward to hearing from you!